My sister Janet and I attempted to make bath bombs for several of the ladies on our Christmas lists. We had great fun trying, but we just couldn't get them to stay together! All was not lost though. Janet just put them back in the bowls and added some more epsome salts to them. She purchased little bottles from the dollar store and divided the ingredients between them. We added decorative stickers to the front of the jars. So, our bombed bath bombs were turned into fizzy bath salts and we couldn't be more pleased! Here is the recipe we used. You might have better success than we did. There are so many reasons why they didn't turn out. We think it was just too humid here for them to stay again. In a large bowl, add all dry ingredients and whisk together. Slowly pour wet ingredients into the dry, whisking them together, slowly. Mixture should be crumbly. Scoop a generous amount into your mold, packing down firmly. Pop the bath bombs out of the mold and lay to dry on a cookie sheet overnight. It was very easy to do. it was a disappointment that they didn't turn out. We let them sit for longer than overnight, but they just cracked apart. 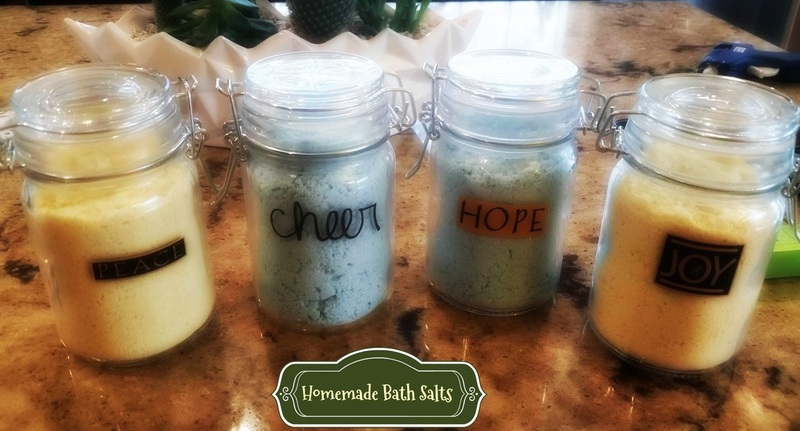 Janet crumbled them back into a bowl and added just enough extra epsom salts to make it more powdery, but not enough to take away the scent of the essential oil.